Not only is this dessert delicious but it is also incredibly beautiful! 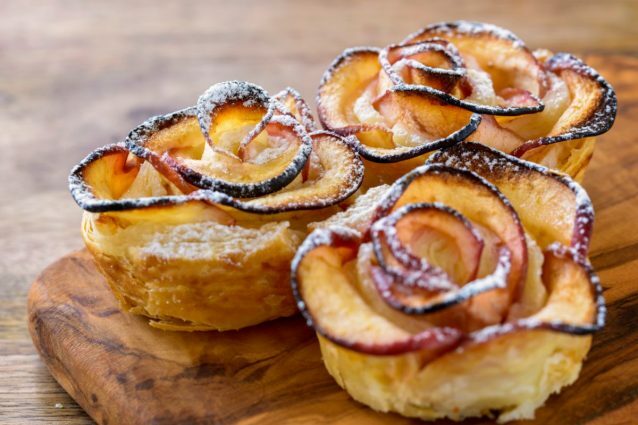 These perfect pastries taste similar to eating an apple pie yet without the work of making pie crust. Shaped like a picturesque rose, you will be surprised at how easy they actually are to make. This dessert is sure to be a show stopper at your next get together or bring a few of them to a friend rather than purchasing real flowers- dessert flowers are so much better than inedible flowers! Cut and thinly slice the apples. Place on a microwavable plate and heat in the microwave for about 45 seconds to soften the apples. Cover the plate with plastic wrap to keep the apples warm and soft an set aside. On a floured work surface, roll out the thawed sheet of puff pastry until it is about 1/8th of an inch thick. Trim the edges of the puff pastry and cut into 4 even strips. Brush the puff pastry sheet with the whisked egg and sprinkle with about half of the cinnamon and sugar. Fold the bottom of the puff pastry in half, over the apples and press down to seal. Beginning at the end of the puff pastry sheet, tightly roll the dough. 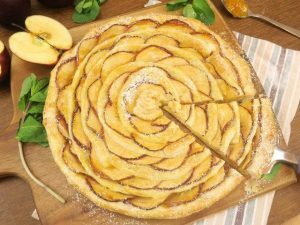 Roll the whole sheet into a spiral and seal the end with a little of the egg wash.
Bake the roses in a 350 ̊F oven for about 45 minutes or until the tops of the apples are golden brown. Remove from the ramekins once cool and enjoy! -You can make these several days ahead of time and store them in the fridge, covered tightly. Simple return them to the oven for a few minutes before eating to freshen them up. Puff pastry apple pie: a perfect snack that is ready in just a few minutes! 3 delicious recipes to make with apples!